The heat is on. Not only inside homes and office buildings as winter temperatures settle in, but as 2017 wraps up, the heat is on to get products out the door. And for auto dealerships, that means the pressure is turned up a notch to move last year’s models off the lot to make room for the shiny, new 2018 versions. That’s where SpeedPro Imaging, the nation’s leading provider of custom signage for car lots, showrooms and promotions, comes into play. Your customers are itching to buy a car. Some are looking to purchase something they can wrap with a big red bow and surprise a loved one with this Christmas. Others are simply looking for the best deal. When your potential customers google “When is the best time to buy a car?,” an article called “6 Best Times to Buy a Car” from U.S. News & World Report is among the first to pop up. Four of the six times to buy a car, according to the writer, happen in Q4. Now is the time for customers to be filing onto your lot and inside your showroom. SpeedPro Imaging is here to assist you in the Q4 sales push. At SpeedPro, we do nothing in neutral. From coast to coast, our studio owners offer Great. Big. Graphics solutions that will help you reach any lofty sales goal. The prime goal at SpeedPro Imaging is to bring your message to life. Your local SpeedPro studio owner has the training, vision and knowledge to drive potential customers from the streets into your dealership. Of our five senses, vision plays a large role on how we shop. The power of visual engagement is a helpful tool when it comes to your marketing efforts. Studio owner Mark Simmons in Apex, North Carolina is a perfect example of how local dealerships are using SpeedPro Imaging’s services to produce stunning, mesmerizing, and cost-effective graphics to rev-up business. Simmons has teamed up with some of the largest dealerships in the state, including Leith Automotive Group. 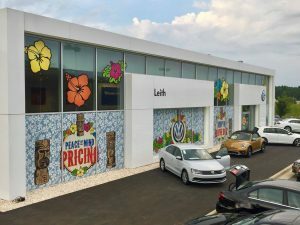 For Leith Automotive, Simmons helped transform a stale Volkswagen showroom into a tropical-themed atmosphere. That includes wrapping the front of the building in hibiscus and tiki. The redesign also featured a prominent floor-to-ceiling logo. With the marketing team on board, providing tie-dye shirts to the sales team and reggae music inside the showroom, the VW store experienced a 30% increase in cars sold. You’ve seen some of the amazing work that can come from partnering with SpeedPro. Now let’s sit down and discuss the powerful solutions we have on hand to help you attract even more customers, especially while the iron is hot! 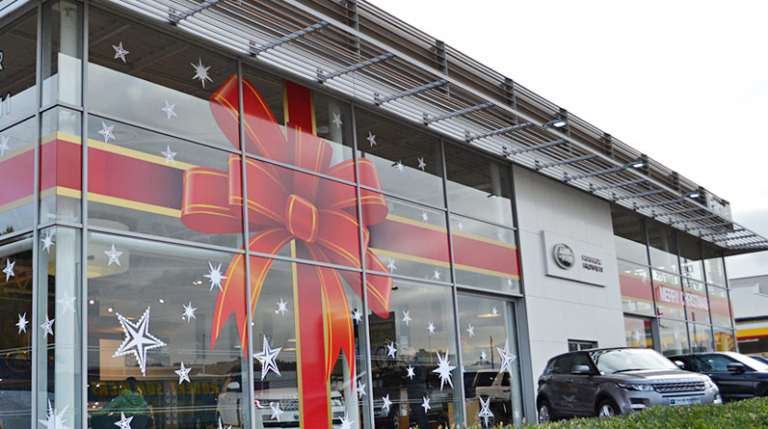 Window Graphics: Your showroom features some amazing floor-to-ceiling windows. Let us help you transform them into pieces of art. We professionally print window graphics in crisp colors on perforated film to capitalize on plate glass windows. Wall Murals: Our sales floor wall murals can be seen from the street. Wall murals are the perfect way to show off a product or service to the people who visit your business. They can easily be refreshed when the new models roll in. Floor graphics: Command attention from the ground up, and wow the crowd with show-stopping floor graphics. Point customers to their favorite vehicles in the showroom or use your logo to direct traffic to the service area on the pavement outside. The floor graphics we provide are designed for durability from a few days to six months or more. Flags: Branded feather flags take great visual advantage of the large dimensions of most dealerships. They are adaptable and can be printed with images that shift with the changing wind. Banners: Banners are popular and effective media for auto sales events or grand openings, as well as for more permanent visual advertising. Ready to take your showroom to the next level? Take us for a test drive and see what we can do for you! You can find the full package when you visit speedpro.com, send us an email or call us at (844) 274-4784.